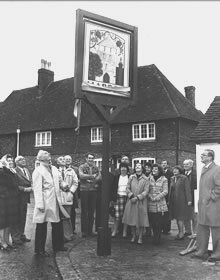 In 1981, the Marden Society decided that Marden needed a village sign, and a design competition was held. The winning design, by Viv Codington, illustrates important aspects of the village, the Church, the Stocks, the old Parish Pump and a hop bine and an apple tree to depict hop growing and fruit growing. It was chosen by committee and the decision was taken to have erected beside the Court House in the historical centre of the village. Pictured here is the unveiling ceremony attended by the signmaker, representatives of the Parish and District Councils and Marden Society of the time: Pamela Banks, Frank Woods, Cllr Hargreaves, John Banks, David Pattison, the painter of the sign (name unknown), Dorothy Reed, Robin Judd, Eunice Doswell, Barbara Judd, Jean Bentley, Ian Menage, Janet McIntosh, Alistair McIntosh and Frank Goldsmith. The original sign was made in wood with painted faces and swung from the top. Unfortunately in high winds it swung too enthusiastically and was in danger of falling off. So, in the interests of safety a second sign was commissioned. This was made in resin by Bernard Hill of Coxheath. It was fixed in a block of wood on a stout oak post.